Dubai schools are embracing iPad learning in classrooms as tech companies introduce more education-focused gadgets into the market. Tech Giant Apple has recently introduced its new sixth generation 9.7-inch iPad, which has features that target students and educators - making it a user-friendly device in replacement of textbooks. Last week, a distress video was circulating on social media, where a father uploaded footage of his daughter carrying a large backpack with heavy books inside. The UAE Minister of Education had publicly responded, highlighting a platform where ebooks can be downloaded onto a student's personal devices. For several years, the debate on whether iPads will replace textbooks in schools has been ongoing. 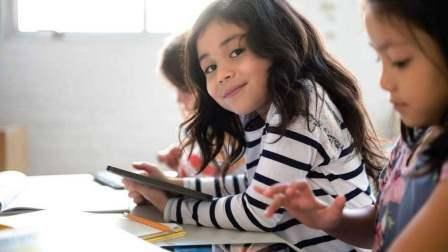 Now, tech companies, such as Apple, seem to be making the switch more tempting as they introduce 'affordable' iPads, with classroom-friendly features. "iPads are a tool that enrich learning experiences, making learning personal to each student. They can help teachers and students to achieve learning outcomes in a more engaging and personalised way as well as encouraging students to become independent learners and thinkers. Having this tool specially devised - keeping learners in mind - allows students to become 21st century learners, creators and innovators," Sreejit Chakrabarty, manager of Robotics Labs and Training at GEMS Dubai American Academy, told Khaleej Times. "iPads allow for flexibility, mobility and make collaboration easy. Students can document and share learning in a variety of spaces and settings. Sharing student learning or student creations is made so easy with journaling apps. Airdrop lets students quickly share documents, images or videos with each other. Meeting the needs of all learners is made possible with the accessibility features that came with iOS 11. Additionally, apps like Dragon Dictation and Read and Write, which support students with special needs." Chakrabarty said the students and teachers at the school are already using iPads as a learning tool. A spokesperson from the Next Generation School (NGS) believes that iPads will replace textbooks "in a few years". Students at NGS also use iPads instead of textbooks for many of their projects. "Students are engaging more in research and projects when iPads are involved since most of them associate iPads with 'fun time', so it has definitely played some role in increasing the energy and engagement in the classroom," the spokesperson said. "Our students are encouraged to come up with proactive ideas and when they use the iPads during projects they have a lot of space to be creative." For a long time, the Google Chromebook was the most affordable option for pupils, as it is lightweight and had student-friendly features. Now, the new Apple 9.7-inch iPad is challenging the Google Android based devices. Starting at a price of Dh1,349, it will be able to support nearly 200,000 apps optimised for education. The Apple Pencil can be used on the iPad, allowing students to edit and produce ebooks and other documents. The education industry has always been an important one for tech firms, with, often, Apple, Microsoft and Google leading the way. As a CBSE student, I am more accustomed with the use of textbooks. Studying for hours using iPad is not preferable, especially in CBSE where one has lots of content. However, iPad is useful in one way as it reduces the heavy weight of books that students have to carry to schools. Also, iPad is environment friendly as it reduces the number of trees being cut each year to make textbooks and iPad also offers a wider range of information. It's easier to gather more knowledge than what's limited to textbook and it's easier to carry. I would personally prefer using an iPad over writing in the copybook. It would save a lot of space in students' bags and most people find it easier to type rather than write something. It is even better for people with bad handwriting or who take a lot of time to write. I think that instead of paying several thousand of dirhams for copy books, that money could easily be invested into the devices. Some teachers may be concerned with some students getting distracted using an iPad, but that issue already happens with phones, so implementing iPads brings in more positive aspects than negative. Personally love how easy studying becomes when using the iPad. It is fast and quick response features ensures a stress-free environment in the classrooms. iPads also considerably help to preserve the environment by saving heaps of paper that could potentially go in the trash but instead we access and use them through the screen. The heavy load of books is minimised by a great deal as they all are virtually available through the iPads technology. Having experienced life at school with and without iPads, I would incline towards the use of iPads.